Cree’s new light costs just $10, will last for years and lower your electricity bill, and is basically indistinguishable from your old, energy sucking bulbs. Until recently, options for non-incandescent light bulbs were fairly limited. There were the cheap and effective but harshly lit CFL bulbs, the expensive but high-quality LED bulbs, and the cheaper but lower-quality LEDs. When Philips released its 60-watt replacement state-of-the-art LED bulb last year, it came with a price tag of $60(discounts are available). Cree, a company that has been in the LED lighting business for 25 years is doing Philips one better: This week, it announced the release of a series of LED bulbs that look like incandescents, light up rooms like incandescents–and cost as little as $10. 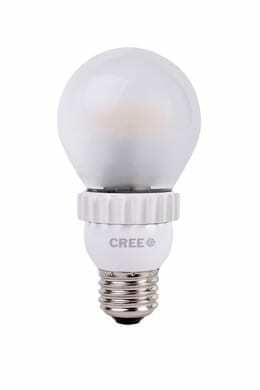 Cree is releasing three bulbs: a warm white 40-watt replacement that costs $10, a warm white 60-watt replacements that costs $13, and a day light 60-watt replacement that costs $14. According to the company, the bulbs have a 25,000-hour lifetime (25 times longer than most incandescents) and energy savings of 84% compared to traditional bulbs. The bulbs use the newest generation of high-power LEDs combined with traditional lightbulb parts. The glass dome over the top, for example, is something you would see in an incandescent bulb. It even comes from the same supply chain–something that helps lower costs. But that dome presented a problem initially. LEDs have to be shatter resistant because of regulations, so Cree had to develop a coating over their bulbs to keep them from breaking when dropped. “There were lots of technical challenges,” says Swoboda. Another big challenge: Making the new bulbs resemble incandescent lights and not the alien-looking LEDs out on the market today. “We put the light right in the center of the bulb, and allows us to make the light come out like in a traditional incandescent lightbulb,” explains Swoboda. Cree sent me a pair of bulbs to try out–I can attest that they do really resemble incandescent bulbs, both in the way they look and the light they emit. I didn’t try too hard to drop one, though, so I can’t speak to that shatter-resistant coating.